Occasionally, cultural fads and buzzwords really rub me the wrong way. Like my dog when someone rubs her fur against the lay, I distance myself quickly and glower, showing the whites of my eyes. I fully recognize that I am writing this piece from such a place. I distanced myself and growled low and slow for months, but as of yet, the harrying has not abated, so perhaps it’s time I issued a warning bark. It may not make a difference, but at least my conscience will be clear. While barking will certainly be part of this piece, I do also want to accomplish more. I’d like to explain why I’m barking, something I am able to do because I posses your language, Dear Reader – a luxury not afforded my vexed dog. Months ago, in the final days of the 2016 US Presidential election, the term “fake news” came into regular use by the US news media. Now, it has been appropriated by the new President, comedians, and Joe Schmo to be tossed about willy-nilly on the regular. I do not know precisely when/where this terminology originated. A surface level investigation turned up no information of genuine repute, but at this point, anyone who passed up the secluded life of a hermit1 knows that this phrase became popular in late-2016/early-2017. “Fake News” as it would have been in the 30’s. So what is this “fake news” anyway? Well a perfunctory break down indicates that it is news that isn’t real. However, to truly analyze it, we need to consider what news actually is. We need to define it and also account for how it is used and understood in a broader social context. News, according to the Merriam-Webster dictionary, is “a report of recent events”. Most would find this definition acceptable. However, in actual practice (at least here in the US) we refer to other commentary as “news”. This includes editorials and reporter/editor interpretations. In short, our culture tends to deem any media material coming out of news outlets to be actual news, whether it is or not. Intellectually, we may know the difference, but we certainly do not act as if they are different. This is a very dangerous path down which to tread and detrimental because it lends credibility to some cultural illusions we’re about to unpack. Speaking of which, let’s start unpacking the word fake. Fake, again consulting Merriam-Webster, is simply “counterfeit or sham”, aka. “an imitation”, “trick that deludes”, or “cheap falseness.” So by extrapolation, “fake news” – since no, it is not in the dictionary yet – is a factually inaccurate account or report that is intended to delude (aka. mislead). Just because I rail against “fake news” doesn’t mean I believe fake news doesn’t exist. Quite the contrary. My objection here is to the misuse of terminology, which obfuscates fake news when it is actually published. Let’s be honest. “Fake news” here in the USA is political, both when there is actual fake news and when there is simply a difference of opinion prompting a misuse of terminology, and members of both US political parties are guilty on all accounts. In the political arena, communication typically takes the form of some kind of rhetoric. For those who didn’t make a college career out of studying language, rhetoric is – the available means of persuasion. When rhetoric is being utilized, there is an attempt to convince some audience of something or an attempt to change an audience’s position. Rhetoric is rhetoric because there is at least an attempt at persuasion, whether it is successful or not. There is nothing inherently wrong with rhetoric itself. People persuade each other to various actions all the time – even choosing what to eat for dinner. It can certainly be used to beneficial accomplishments, and likely modern society would not exist without it2. The problem arises when rhetoric employs “means of persuasion” that are unethical, manipulative, base, harmful… I could go on, but you get the picture. In most cases, the majority of people would agree that lying to get someone to change his/her position would be unethical. Here is an example of legitimate fake news in the months prior to the 2016 presidential election: On Facebook, a friend of mine posted a link to an article that, under a clickbait title, informed its audience of a newly introduced immigration bill termed “The Trump Bill”3. This article even supplied the HR (House of Representatives) bill number, meaning it had been proposed and was in process. That was really its undoing because, skeptic that I am, I went to Congress’ website (congress.gov) and looked up the referenced bill. I checked the number multiple times. I even used copy/paste to be sure I was on the right one. I did it again and again – just to be sure, because I could have made a mistake, right? But guess what? The referenced bill didn’t have anything to do with immigration. Not only was the bill about energy, specifically petroleum, it didn’t even have any riders. This, my friends, is fake news – factually inaccurate reporting intended to work folks into an emotional frenzy. Let’s get one thing straight – editorials are not “fake news”. Why? Because they are not news. They are commentary. They contain, admittedly so by their very name, the opinions of the editors or reporters delivering them (or financiers of said media personnel). So stop calling editorials “fake news”, and stop calling stories/editorials/commentary you don’t deem news worthy “fake news”. Stop hiding your differing opinions behind a guise of fact. Opinions are subjective and always will be. Just because they are yours, does not make them fact, no matter how well researched or firmly believed they are. Own your thoughts, beliefs, and self. Stop being cowardly. “I disagree” is a perfectly acceptable response to any commentary; “It’s not real” is not. Now let’s move on to what language scholars have known for decades and the second reason I object so to the current use of the “fake news” term. True objectivity in reporting, description, really any language use at all, is practically impossible. As much as we would like to believe our senses are reliable preceptors of the world around us, they are not, and because of the power of our attention, those senses are very selective about what they perceive. Additionally, these perceptions have to be translated from neural input to language. The cognitive processes of an adult human are inextricably intertwined with language, so what you think and believe will influence your language choices. Unfortunately (perhaps?4), you cannot ever be truly unbiased. Your worldview will be reflected in the language you use, even if you are trying really hard to be neutral and most do not notice your bias. It just comes out. In one of my graduate linguistics classes, my classmates and I analyzed two news reports of a bombing incident in Ireland that occurred during its civil war. Both of these reports were reports, not editorials, and they were extremely well done, far more objective than many news reports today. However, under close inspection of the language, the reporters’ sympathies became obvious – one National Army, the other IRA. This was true even though the events reported were exactly the same. Both word choice and word order can be quite revealing when carefully scrutinized. It means that reporting is subjective and always has been as long as there have been humans telling stories about what happened. Linguists have known this for a long time and moved on with their lives. To those of us who have studied these topics, it is surprising that the rest of society is just now finding this out5. It is even more baffling that society can’t seem to come to terms with reality and move on. Rather, person after person rails on his/her soapbox about the evils of “fake news” and makes it her/his mission to point out “fake news”, then eventually you get an article from yours truly about “fake news” and can likely know every time I am rolling my eyes while I type because you can hear it in my voice. You may find yourself wondering how to determine what is true and false in a world where bias and subjectivity are inescapable. This really is an excellent question, and the answer is fairly simple. Expose yourself to the different versions of the story. Getting news from one source will lead you to a very distorted view of the world and the events that happen in it. Only by seeing a “big picture” and its context can you hope to have a more robust understanding of what’s going on. Now does this mean I’m giving the news media a by to engage in shoddy reporting and commentary? No. Today, everything is available before we really have a chance to consider it. Just a couple weeks ago, I made a small order on Amazon at 9am and it was delivered to my doorstep at 11am – same day. We have fast food, fast travel, and fast information – the latter via our good friend the Internet. Well actually I stand corrected, you can get all three there. The Internet has dramatically sped up the pace of the whole world6. Nearly every aspect of an American’s life has been impacted by this technological marvel and the speed at which it delivers information. The news media is no different. In order to stay relevant, news organizations have adopted the strategy of producing a lot of information very quickly. They do this because of competition (Hey, anyone can publish now!) and attention span. Information flashes by us at light speed (if you have a fiber connection), and humans are really easily distracted. But here’s the rub – the one of which every good writer, reporter, artist, artisan, athlete is painfully aware – quality work takes time, just like fine wine, handcrafted furniture, or rippled abs. You don’t make the good stuff in one hour or even one day. It takes time to tweak language. It takes time to analyze your own work and critique it. It takes time for others to critique it. It takes time for all of the facts to come out. Unfortunately, because media organizations fear for survival (and rightly so) most of them have sacrificed time and quality for quantity, thus producing really shoddy work. There is now an over-reliance on click-bait titles and sensationalism. The hyped-up, quickly-produced crap gets the attention. Attention means survival for another day, so they make more. Some of us shun this type of reporting, but in reality, most don’t. Sure, I’m much more forgiving of typos and mistakes on someone’s blog or the website of a small company. Likely that person isn’t working with a team that should be catching such mistakes. But a national news agency making these mistakes? Unfortunately, I see it all the time, and it is because the material is produced so quickly. There are many news outlets to which I no longer pay any attention simply because they continue to publish material riddled with typographical and formatting errors. How am I to trust them with actual reporting? They did this to themselves. I do feel some sympathy since speed and visibility became synonymous with survival, but surviving is not thriving. So I also pass blame. Shoddy journalism makes me only slightly less crazy than “fake news” because I understand and can sympathize with its origins. 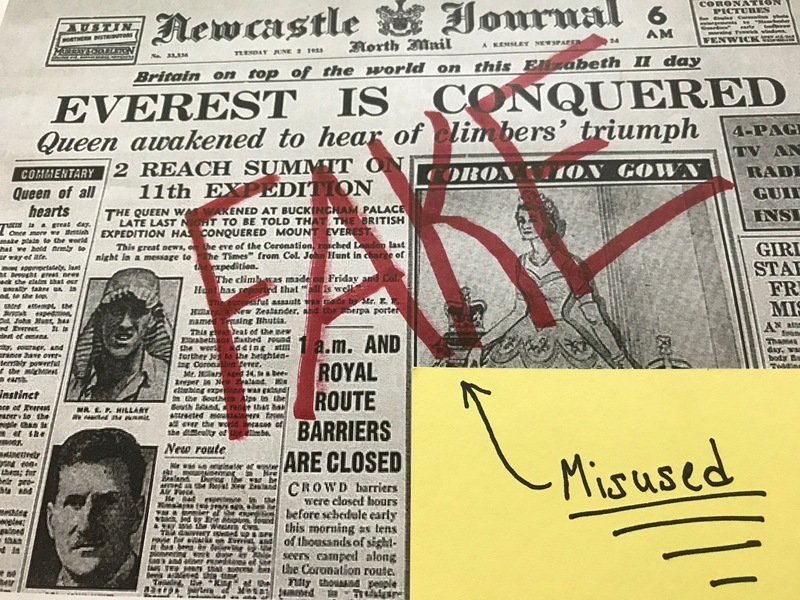 The origins of fake news – people trying to convince other people unethically? No sympathy there. And the origins of “fake news” – people misusing terminology and not having enough guts to own the fact that they disagree? Again, no sympathy there either. I suppose I should end this piece with a call to arms, “You can do better. Do better!” So there you go; I said it. That call is directed to anyone and everyone who reads this and some who never will. Believe it or not, you can influence these organizations simply by the stories on which you click. Stop clicking on trash. And oh yeah, stop using “fake news”. It’s a buzzword, and you are only increasing the amount of linguistic crap in the world. If you don’t agree with the commentary, muster some fortitude and say so. If you find factual inaccuracies, report them to the news agency. They will likely publish a retraction and correct the issue. If the piece in question is factually inaccurate and is sensational and manipulative, call it by its true name – unethical rhetoric. God, I wish for it sometimes! Hey, people are dying in our hospitals, why don’t we start washing our hands with running water? Oh how I wish I still had that link! But alas, I cannot locate it anymore. Of course, perhaps this is a good thing. Perhaps my friend realized what a load of crock it was and removed it after all. Personally, I don’t think this is unfortunate at all. I think it’s part of what makes us human, but I’m trying to leave my existential musings out of this as much as possible. I suppose we took it for granted. If you don’t want to accept my anecdotal evidence, please read Thomas Friedman’s The World is Flat. There are actually some numbers in there.